Will We Be Feeling the Bern in 2020? : Sanders on Whether He’d Ever Run for President Again | Democracy Now! Vermont independent senator and 2016 Democratic president candidate. In the wake of Donald Trump’s presidential election victory, many Sanders supporters now wonder if he would have been the stronger candidate to face Donald Trump in the general election than Hillary Clinton. Sanders is now working to rebuild the Democratic Party from inside and out. Earlier this month, he was elected to a leadership position in the Senate as the new chair of outreach for Senate Democrats. In addition, Sanders is leading the push for Congressmember Keith Ellison to become the next head of the Democratic National Committee. But would Sanders himself run in 2020? On Monday night, Democracy Now!’s Amy Goodman sat down with Senator Sanders for his most extensive broadcast interview since the election at the Free Library of Philadelphia, where she asked him whether he might “feel the Bern” again in 2020. AMY GOODMAN: Will you be running for president again? SEN. BERNIE SANDERS: Oh, now you sound—OK, now, she waited ’til the end of the program to sound like a mainstream media person. SEN. BERNIE SANDERS: Well—well, let me answer the other question, is—four years is a long time. I’ve got to—you know, I’m going to be running for re-election most likely in two years for Vermont to the Senate. And there’s just an enormous amount of political work that has to be done at this—at this moment. I think, you know, as now having been recently appointed a member of the Democratic leadership, my job, with the help of everybody in this room—look, we’re going to ask a lot from you. And here’s the bad news: We don’t want just your money. See, and one of the things that bothers me is—and I will take this on—is Democrats spend an enormous amount of time raising money. And I have—for those people who were kind enough to donate—and we appreciate it very much—I’ve got to ask you a favor. Do not take up so much time—and I mean this very seriously—time of the candidates. They—if I have anything to say about it, they’re going to be going to Kansas and Mississippi and Alabama, where they’re not going to be raising money, they’re going to be talking to working people. So we need financial support, but we don’t have the time to spend an evening with 10 people. We need your financial help, but you have to allow serious people in politics to go out and start talking to working people so that we can transform the politics of this country. AMY GOODMAN: Is that—is that a yes for 2020? 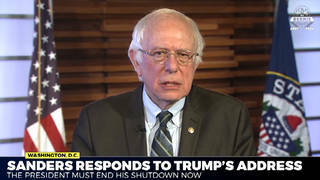 SEN. BERNIE SANDERS: So, no comment for 2020. It’s a statement that—it is a statement we have to worry, believe me, about 2017 and 2018. And again, let me repeat what I have said throughout the campaign and I believe absolutely from the bottom of my heart: Politics is not about a person. We transform this country not by electing some guy or woman to be president; we transform this country when millions of people stand up and fight back. That will result in good leadership on top. So the goal right now is not to worry about who’s going to be running in 2020 or 2080. The goal now is to mobilize millions of people around a progressive agenda. AMY GOODMAN: —like joining with the Green Party? SEN. BERNIE SANDERS: You know, I did that. In Vermont, as many know, I defeated Democrats and Republicans to become mayor, defeated Democrats and Republicans to make it into the Congress. Recent years, Democrats have been more sympathetic. And I’ve been a member of the Democratic caucus for 25 years. So right now I would not have accepted the position of leadership if I was not serious about fundamentally reforming the Democratic Party. So that’s where my head is right now. SEN. BERNIE SANDERS: This is your fourth last question! AMY GOODMAN: What did you learn from your campaign this time around? SEN. BERNIE SANDERS: Good question. AMY GOODMAN: Where you almost won. SEN. BERNIE SANDERS: Let me just say this, and the feeling of—I wouldn’t use the word “discouragement.” The feeling of maybe frustration, depression, all of which is valid, but here’s what I hope that everybody remembers. Anybody who knows anything about American history, you know, think about what this country—and I don’t mean to be ultra-patriotic here, but think about the issues that we had to confront. Think about 120 years ago. There were children—children, kids, 12, 10 years old—working in factories, losing their fingers. People fought back. They fought to create unions. Think about the women’s movement. Think about the civil rights movement. Think about the gay rights movement. Think about the environmental. Think about all of the hurdles that those folks had to overcome. We were, during the course of the campaign—Amy, I don’t know if you know this; I didn’t know it 'til last year—we were in Birmingham, Alabama. And all of you, you know, probably remember the horrific bombing that took place in Birmingham. You remember that, where 12 children were killed? I did not know, until I was at that church, that that month in Birmingham—do you how many bombings there were in that month? Testing you, Amy; I'm asking you a question. SEN. BERNIE SANDERS: No, but there were a lot. Point being—what’s the point? The point is—you know, I thought there was one terrible bombing. There were 13 bombings. That city was under siege by terrorists who did not want to see the Voting Rights Act passed. And people fought back. So, where we are now is in a difficult moment. I don’t want to minimize the difficulties facing us. But throughout history, serious people have fought back. That’s where we are now, and that is exactly what we have to do. It is not acceptable—it really is not—for people to throw their hands up and say, “Oh, I’m depressed. Oh, I’m giving up.” It’s not about you. It’s about the future of this planet. It’s about your kids and your grandchildren. It is about American democracy. It is about some very fundamental issues. And nobody in this room or in this country has a right to say “I give up.” On the other hand, you’ve got to jump in and start fighting. AMY GOODMAN: That’s former Democratic presidential candidate Vermont Senator Bernie Sanders, who’s now in the leadership of the Democratic Party in the Senate, even though he’s an independent socialist. He is author of a new book; it’s called Our Revolution. I interviewed him Monday night at the Free Library of Philadelphia. To watch Bernie Sanders’ full speech before we actually spoke, you can go to democracynow.org. Tune in Wednesday to Democracy Now!, when we’ll speak with Green Party presidential candidate Dr. Jill Stein about her efforts to force recounts in Wisconsin, Michigan and Pennsylvania. Also join us next Monday, December 5th, at Riverside Church in New York City for Democracy Now!’s 20th anniversary celebration, featuring Harry Belafonte, Noam Chomsky, Patti Smith, Danny DeVito, Danny Glover, Tom Morello, Juan González and many more. You can visit democracynow.org for details. Love to see you at Riverside Church December 5th. Oh, and we have job openings. Democracy Now! is hiring a senior TV producer, details on our website, as well as interns and fellows. Check out democracynow.org. A very happy birthday to Deena Guzder!